To attain and sustain success in today's dynamic business environment, it's no longer enough to be good at just one type of marketing. Expanding into additional channels-especially the Internet-will help you attract prospective customers and increase your revenue. In fact, if you're only using one channel, you're likely leaving millions of dollars on the table and in danger of losing the customers you already have. 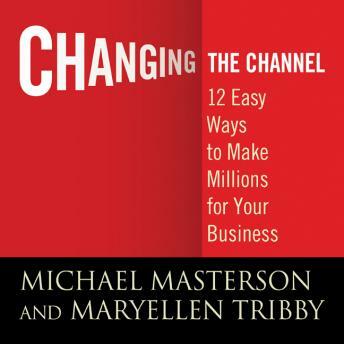 Masterson and Tribby understand the importance of multi-channel marketing. Through their combined 59 years of business experiences-working with companies such as Agora Inc. and their Early to Rise e-newsletter, as well as other distinct products-they know what it takes to increase business success and now share their invaluable insights with you. Written in a straightforward and accessible style, they offer a detailed look at twelve of today's most important marketing channels-explaining how each one works and addressing the challenges you might face should you choose to use them. These include: direct online marketing, social media, public relations, radio and television advertising, direct space ads, event marketing, telesales, telemarketing, joint ventures, affiliate marketing, and direct mail. Learn to create successful marketing campaigns and analyze test results to optimize their effectiveness. Track customer buying habits with a database that covers all marketing channels, and avoid the temptation of trying to sell your customers every time you contact them-a mistake that could hurt you in the long run. Adopting a multi-channel approach to marketing today will guarantee success tomorrow. With this audio book as your guide, you'll discover how marketing your ideas, services, or products across multiple channels can help develop and deepen customer relationships and improve your bottom line.